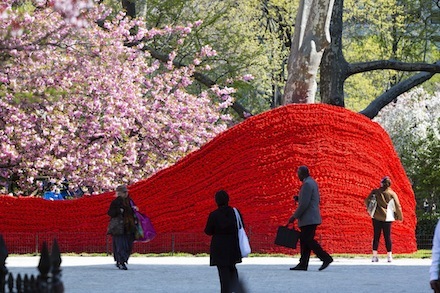 Genger, 34, is known for pushing the limits of sculpture using rope and found materials. 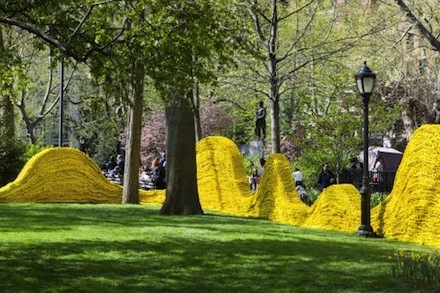 Her large-scale installations play with the language of the Minimalist, Post-Minimalist and Feminist art historical canon, often utilizing massive installations of repurposed materials. Past works have referenced Tony Smith, Donald Judd and Walter de Maria, and 2010’s Big Boss at Mass MoCA included 100 miles of red rope that suggested a play on abstract painting. Though executed in a vocabulary all her own, Genger’s Red, Yellow and Blue also recalls the monumental forms of Richard Serra and the pop textures of Claes Oldenburg. Assembled, cleaned and braided over two years, Red, Yellow and Blue is Genger’s largest and most labor-intensive project to date, covering about 4,500 square feet over three of the park’s lawns. 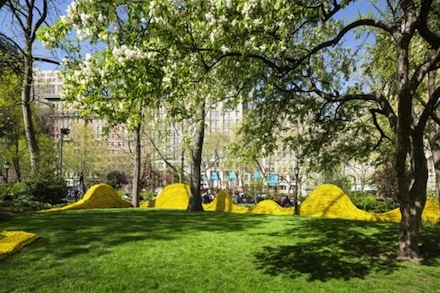 The bright undulating forms respond to the curves of the landscape and trees, suggesting waves in water, perhaps a reference to the ropes’ former purpose, and New York’s past and present interconnectedness with the Atlantic. 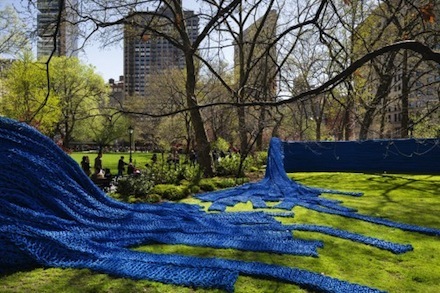 The exhibition is just one more entry in an extremely popular series of installations at Madison Square Park, and will continue through next month, when Genger’s installations will be replaced by the sculptures of Giuseppe Penone. 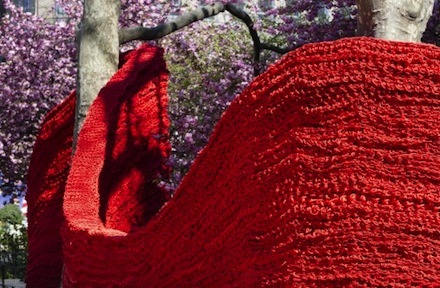 “Orly Genger: Red, Yellow and Blue, in Madison Square Park.” [Artinfo.com via YouTube.com]. This entry was posted on Thursday, August 29th, 2013 at 12:00 am	and is filed under Art News, Go See. You can follow any responses to this entry through the RSS 2.0 feed. You can leave a response, or trackback from your own site.